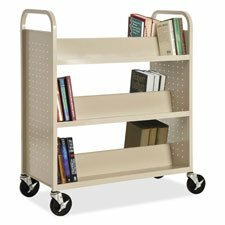 Double-sided book cart offers a total of six slanted shelves where you can organize and transport plenty of books and other items. Each shelf measures 36"" wide x 6-3/4"" deep with 12"" between shelves. The sturdy design features smooth rounded handles for easy maneuverability and perforated end panels for style and better air circulation. Cart moves easily on 5"" casters that all lock for when you need the cart to stay put. Weight capacity is 200 lb. Cart is made of welded steel with a powder-coat finish for long-lasting durability.